The Big Issue Shop Winter Sale is On! There are lots to choose from including beautiful soaps and toiletries from The Soap Co, an eclectic range of Street Art and unique, jewellery pieces from Quazi, and Studio 306. All products come from social enterprises that help and support a variety of causes from around the world. From funding access to clean water, to employment for those struck with poverty, you can be sure your money goes further with The Big Issue Shop. Just To Say A Big Thanks! With the year coming to a close and a new one coming just around the corner, The Big Issue Shop would just like to thank you all for supporting the cause! Together, we have supported a variety of social enterprises and initiatives that have positively affected people from around the world, whilst also spreading awareness of homelessness within the UK. It’s been a whole year since The Big Issue Shop has opened and twenty-five more since The Big Issue Magazine started. Since then we’ve helped support thousands of people out of homelessness and continue to believe in giving a hand up and not a handout. So to celebrate, here are some our favourite highlights of the year which include our Call For Change Campaign, featuring a discussion with Labour Leader Jeremy Corbyn. 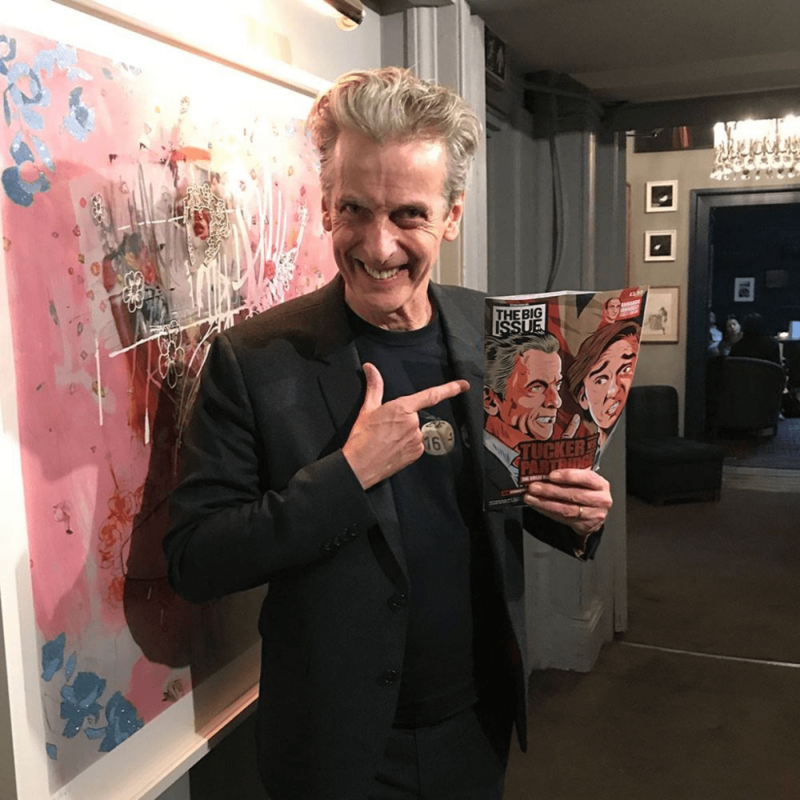 Another highlight is Peter Capaldi proudly showing off his Tucker Vs Partridge magazine. We hope next year will be brighter, bigger and better, with the goal of eradicating poverty still firmly in our sights. The countdown to Christmas has well and truly begun and what better way to make your money stretch further than to get a gift that also supports a great cause in the UK and beyond? To make it even easier, we’ve got ‘Gifts for Him‘, ‘Gifts for Her‘ and ‘Gifts for Kids‘ collections so you can get everybody covered. We’ve also got limited edition wrapping paper which were designed by various top artists including Ben Eine and Sarah Pope. Other designs include ones by Street Artists Rene Robbins, John Sheehy, and even our own founder, John Bird! If that’s not enough we’ve also got a collection of exclusive festive cards, featuring six of our best Christmas Big Issue magazine covers. These also include some very special covers designed by winners of our Kids Christmas Competition. All profits go to help people living on the margins a hand up. So be a Social Santa this Christmas and get a gift that keeps on giving! Black Friday is here and whilst you could go battle a bunch of bargain hunters for a budget 50-inch telly in the aisles of the local supermarket, there is a better, easier way! To mark the occasion, The Big Issue Shop is slashing prices with exclusive deals and massive discounts that will let you support great causes in the UK and across the globe all weekend long without feeling the pinch in your pockets. There are discounts on Fairtrade toys, street art prints, handmade jewellery and more. Great for stocking up on Christmas presents, birthday gifts or just a little treat for yourself. So get a gift that keeps on giving, all without leaving the house! 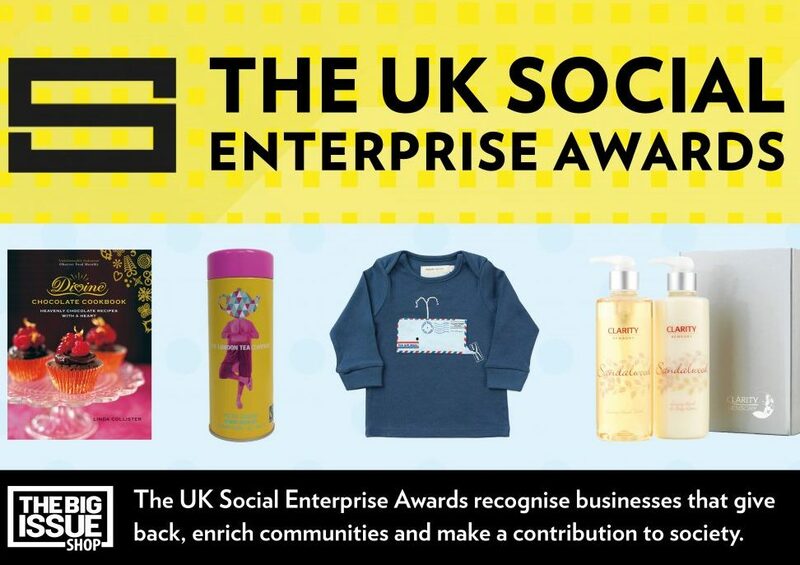 The SEUK Awards, Vote For Your Favourite Enterprise! The UK Social Enterprise Awards recognise businesses that give back, enrich communities and make a contribution to society, as well as those who lead them – the social entrepreneurs who use their business acumen to make a real difference, tackling social and environmental problems both in Britain and abroad. The Big Issue marked its ’25+1 birthday’ with a special edition of the magazine – and an exclusive exhibition was held at The Framers Gallery, London, showing artwork by its founder, Lord John Bird. The founder’s artwork addresses themes of the human form and nature, with an ever-present undertone of the benefit of doing social good through social trading. Get Ready For Social Saturday! Social enterprises are businesses that put people and planet first, by re-investing their profits to provide training, employment, education, clean water and much, much more. Social Saturday is an annual campaign to raise awareness of the difference that social enterprises are making in communities, both on your doorstep and around the world. The day encourages you to support these businesses when making your purchasing decisions. Check out our dedicated collection and make sure your money goes further with shopping social! Every week in The Big Issue, our Street Art page gives talented, marginalised individuals an outlet for creative expression, as well as a platform to sell their prints through The Big Issue Shop. The Big Issue believes in the power of people and thought-provoking protests. 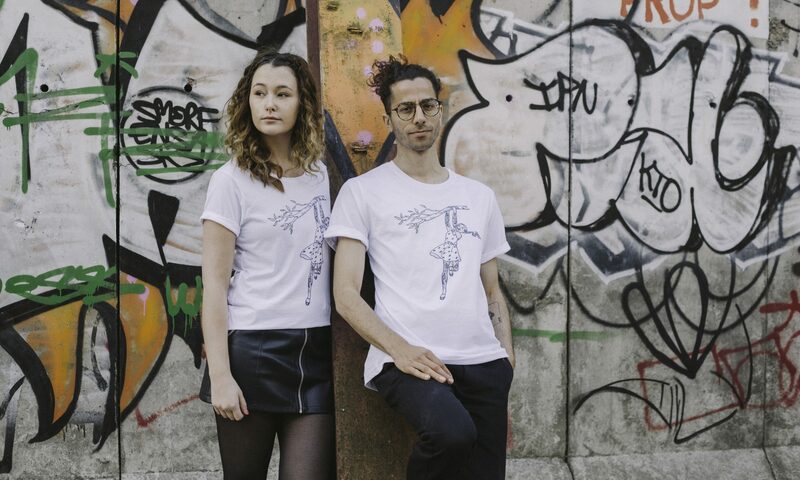 With that in mind, we have specially created a collection of t-shirts and mugs that are customisable with personal statements, unique to your cause. So even if you’re passionate about ending poverty or engaged in environmental issues – you can say it out loud with a Big Issue product. Anytime you see “Customise Me” in store, you will be able to change some or all of the text within the design. Just look at the options available and type into text boxes to personalise your message. We print custom products on demand, and we will edit the design with your message intact before sending your package to your door. Every item purchased helps us to achieve our mission of dismantling poverty and creating opportunities for the disadvantaged.